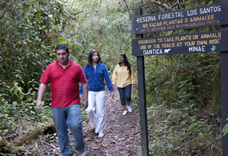 Our 20 hectare private Dantica Cloud Forest Reserve has an ideal trail system for birdwatching and the Bungalows are directly connected to these trails. There is a main trail connecting the reception are to all the Bungalows, which is lit at night. From there several entrances lead to the forest trails that are made in the most natural way to minimize the impact on the forest and its inhabitants. 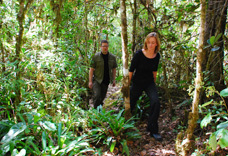 Our forest is under protection of the Minae and only visitors staying at our lodge have access to the trails in our forest. Almost 5 km of trails guides you through different types of primary forest with a crystal clear mountain stream, as well as various stages of regenerating forest. Orchids are flowering in the rainy season (August-November) and the beginning of the dry season (December-January). Many green bromeliads thrive on the forest floor while the red ones crown the canopy some 40 meters above you in this realm of the Quetzals. We provide a map of our trail system for our guests, so you can guide yourself through this beautiful forest. There are several wooden posts along the trails that serve as markers, so you can see where you are on the map. Also easier and more difficult trails to walk are pointed out on the map. Keep your eyes open, especially near the river, where you have a greater chance to see large mammals.